Are you tired of being overwhelmed by inadequate customer service and hidden surcharges? At Discount Dumpster, we make sure you receive first-rate customer service in Antioch, with the best deals in the industry to match. Our roll offs are priced to fit any sized budget, and our goal is to help you find the right container for your project. Call today to rent a roll off in 10, 15, 20, 30 and 40 cubic yard sizes. We can also give you a free estimate including delivery and pickup, your rental duration, and all applicable fees. Call us today to rent a roll off. Our roll off rentals come cheaper than one can think. Our pricing is so that the community receives the best possible deal in the industry. We have absolutely no hidden surcharges and set the prices at low flat rates. Our waste disposal service delivers to residential and commercial properties. The usual rental duration is 10 days, but you can keep the container for as long as needed. So call us to rent a roll off today. Lets see if we have the waste disposal option for you. We are confident we can save you time and money! The 12 yard bin is ideal for attic and garage cleanouts. Its small size allows for the vessel to fit on any property. The 12 yard allows you to dispose of cleanout rubbish such as broken furniture. Slightly larger than the 10 yard container, the 15 yard is typical for small-scale remodels. The 15 yard’s size allows it to hold household debris such as scrap metal and piping. Its low height allows for the easy transfer of waste for any customer. The 20 yard roll off is best suited for landscaping projects. You can easily discard of lawn rubbish such as soil and grass. The 20 yard is can also be used for small-scale refurbishes. Smaller than the 40 yard, the 30 yard container is typical for multiple full room demolitions. 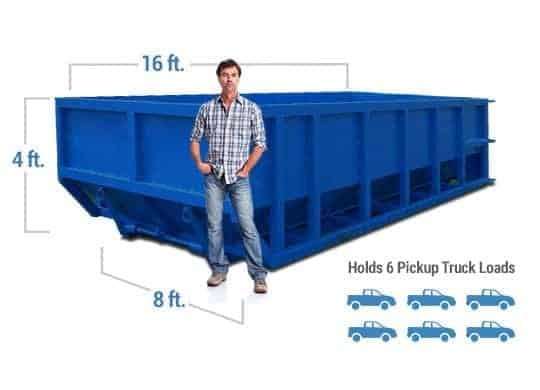 Its relatively large size allows the dumpster to hold construction clutter with ease. With 30 cubic yards of space, it is perfect for large-scale building renovations. Our 40 yard waste receptacle is the best choice for contractors working on large building planning. You can unload several tons of rubble with the 40 yard. It is commonplace for contractors performing large-scale building leveling. What are you Waiting For? Rent a Dumpster Today! There is no reason to continue shopping around for the best deals concerning waste disposal. Discount Dumpster is the cheapest place to rent a roll off. We know we have you covered with our low flat pricing and unbeatable rental terms. Our rental agreement allows you to keep the dumpster for two weeks under our flat rate fee. We have absolutely no hidden fees associated with our rentals. Our goal is to make everything hassle-free and convenient for the customer. We want our Paragon Mills customers to easily afford properly discarding their waste. Call us today for your flat rate roll off rental. Save More with Discount Dumpster. When it comes time to perform that annual spring-cleaning project, you may find that there is so much junk piled up that discarding it with household trash is not a good option. That’s when you should consider renting a residential roll off dumpster from our waste management service. Our goal is to make every clean out easy. We make sure that you rent a roll off suitable for all your needs. Call us today and consult with our highly recommended customer service team. We will make sure you get the container that best suits your project. We can provide you with a roll off rental for any project, including concrete cleanup. Our service will make the disposal process easier for you. Once you call us you won’t have to worry about hauling away all that concrete in your pickup and then finding a site to unload it. Concrete can be loaded in the 20 yard, but only halfway up the container. Otherwise we cannot haul it away and you may be fined a trip fee. Call us today with any questions and to take advantage of our heavy debris management service.